A.J. Smith Federal Savings Bank® has been a fixture in the South Chicago suburbs for 86 years. They share their surrounding communities’ environmentally-conscious way of thinking and wanted to find a creative way to encourage customers to convert from paper statements to e Statements. To do so, they created a promotional campaign utilizing in-store displays and their website as well as e-mail blasts that offered customers a reward for converting from paper to e Statements. Upon converting to these electronic statements, customers received a branded, Plant-A-Tree Card printed on 100% recycled paper. Cardholders went online to donate a tree in the company’s name to one of many global reforestation projects around the world. Plant-A-Tree Cards were an innovative incentive to motivate their customers to act in an environmentally way, while serving to promote A.J. 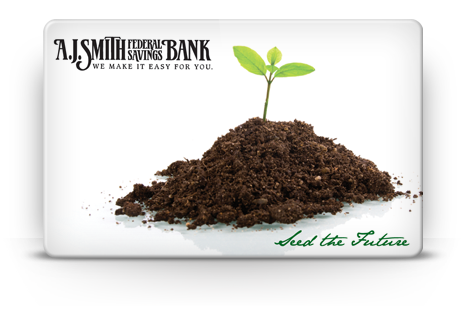 Smith Federal Savings Bank’s image as an eco-friendly business.